A large part of Perfect Circle Racing is about education and training. There is nothing magic about competing in a high end racing program, but it does require a different skill set than most people poses. The best crew are those who are committed to excellence, able to work well in a team, and are always trying to learn more about their job. If you are interested in attending an On the Water class, please call or email Fred (fred@perfectcircle.com or 619.342-0477) and let him know in which class you are interested, and your availability (after work or on weekends), and he will schedule the next class. 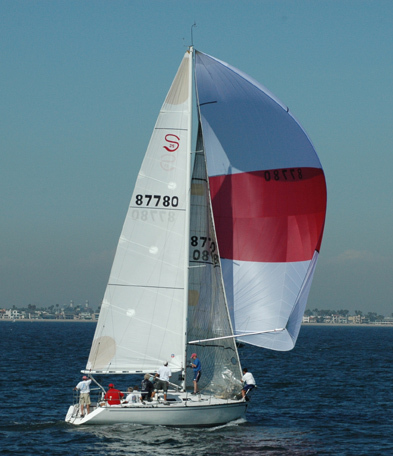 Then download Definitions and Terminology and make sure you understand all the terminology used on a sailboat. First download Definitions and Terminology and make sure you understand these terms. Then call Fred at 619.342-0477 and tell him you want to be certified. He will discuss with you your knowledge and experience, and either recommend additional training, or schedule you for your certification test. The Certification tests include a short written test, an oral test, and a practical on the water test. Upon completion, you will be issued a certification certificate. Necessary for every racing crew. Everyone on board must know the words used to communicate. Review this list and make sure you understand each term. Learn or review Sailboat rigging (including spinnakers), sail handling, maneuvers, crew positions, how to be a good crew, how to be a good skipper, and more. For both new and experienced sailors, this session will cover basic and advanced techniques to manage a spinnaker including rigging, setting, dousing and jibing. Buddy Melgess tactics are Start First and Increase Your Lead. This session will cover the Start First portion. If there is interest, we may partner with Oceanside Yacht Club and put on an on the water starting clinic. Learn the ins and outs of sail trim including: how to trim your main and jib for acceleration mode, as well as high speed mode; how to trim a chute in very light air; why the pole is a primary trimming control, and more. Once of the most difficult tasks in sailing is driving a boat downwind for both speed and safety. This session is for helmsmen who want to improve their abilities, and sail their boat safely. Analyze the Windward/Leeward race format and the tactics required to get ahead of your competition. Learn the most important maneuvers so you can make the most of your practice time. Analyze the distance race format and the strategies required to finish first. Learn about weather and the trigonometry to decide if going out for more wind will actually help you to finish faster or not. Learn how to set up a successful racing program. What you should expect, what your crew should expect, how to select and train crew, what races should be added to your schedule, when to buy sails, and much more. A breakdown of the Racing Rules to allow you to feel comfortable sailing close to other boats and racing with the big boys. Learn which rules are very important, and which ones are not so important. Learn how to drive a boat for performance. Improve your ability to drive upwind, on a reach, and downwind. Learn how to pick up time and position when rounding both top and bottom marks. Learn how to make VMG work to your advantage. Learn how to set and use Polars to get more speed from your boat. OK, not really a racing topic, but occasionally you will want to anchor in that nice quiet cove and feel comfortable you can go to sleep and not end up on the rocks. If you have any other topic you would like discussed, please email your suggestions to fred@perfectcircle.com, and Fred will try to find an expert to make a presentation. This shows a Top Mark rounding. Click on each picture to enlarge it, and look closely at the position of the sails and crew as the rounding is being performed. This shows a Top Mark Spinnaker Set. Click on each picture to enlarge it, and look closely at the position of the sails and crew as the set is being performed.